This lilac satin dress from Te Papa’s collection was worn by Rosa Criscillo at her wedding to Antonino Moleta in Wellington on 5 May 1909. It is a dress that marked not only Rosa’s transition from a single woman to a wife, but heralded the beginning of a new life on the other side of the world. This dress was made in Naples and brought to New Zealand by Rosa for her wedding day. Twenty three year old Rosa travelled from Stromboli, Italy, accompanied by her father and brother, to marry Antonino (Nino), a young farmer whom she had never met. Before she arrived, a proxy marriage was signed by Bishop Redwood in Wellington. The day she arrived, wearing this dress, the couple sealed their marriage at the Wellington Registry Office. Rosa must have looked a vision as she stepped off the ship in her soft lilac gown, although she was no doubt somewhat hesitant about her future life at the end of the world. The Italian made gown is representative of the fashion of the time. The bodice and skirt is made from a cotton silk satin, and is trimmed with ivory machine-made lace, ivory silk gimp and metallic sequins. It has full-length, puffed sleeves, gathered at the forearm with cream lace cuffs. 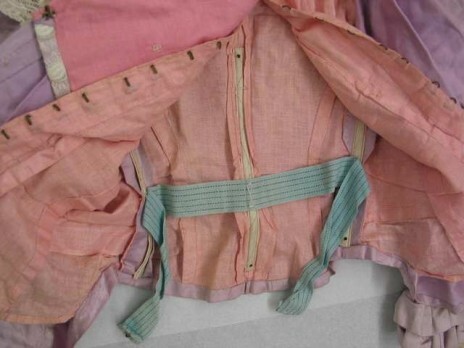 The bodice has stays and is lined in warm pink cotton – a lovely surprise. The skirt is gently flared with minimal decoration, except for a few lace appliquéd flowers. The inside hem is protected by a pink cotton strip with narrow brown edging. Following Rosa’s death in 1958 the dress was looked after by her daughter, Maria Moleta and was gifted to Te Papa by Rosa’s grand daughter Margaret. Rosa and Antonino, who passed away in 1967, are buried together in the Karori Cemetary. Wedding Dress of the Week is posted in association with the exhibition Unveiled: 200 Years of Wedding Dress from the Victoria and Albert Museum, London which is on display at Te Papa until 22 April 2012.
i never got to see the dress but it was my great grandmothers dress and from the pictures i have seen it looks so beautiful. Hi Jessica – if you are ever planning on visiting Wellington, just give us a little advance warning, and we’d be happy to arrange a time for you to see it. It is a lovely gown, and has such a wonderful story. All the best, Claire. The dress has several special designs,which made the dress awesome.Thanks for sharing this great dress. We are thrilled to have it, and very thankful that the family were kind enough to donate it to Te Papa. Not only is it a beautiful dress, but it carries with it a great story.